You’d be in maniacal love with non-vegetarian food if you’re one. Pretty naturally, you’d feel like ordering non-veg every time you go out to eat (in any case what choice does vegetarian food has to offer you-Paneer, paneer and more paneer…phew! ).How do vegetarians survive…I mean, seriously…there’s so much of awesomeness that they’re missing in life. 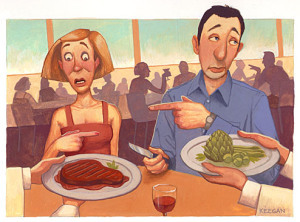 Anyway, coming back to the point…you have two options when you’re eating out with your girlfriend/boyfriend. They would refuse to look at you and your plate…making you feel like an untouchable. Every time you’d pick up a leg-piece, they’d give you those, ‘you-have-committed-a-MURDER’ looks. They won’t share their shakes with you, saying that you cannot use the same straw. They would not come close to you, complaining that you SMELL of non-veg food! They would keep sending you animal slaughter videos. And, the MOST IMPORTANT…they would refuse to kiss you. Because, logically kissing you would mean that they've turned into non-vegetarians too :O. And, then…even after choosing the second option…you would suffer! So, there’s clearly no-escaping the suffering. Having non-vegetarian food is necessary…because…umm…otherwise…the food-cycle will get disrupted…the ecological balance will get ruined and then they’d be too many herbivores and they’d eat away the entire grasslands…and then…the world will turn into a desert…and…then…we’ll all die…earth will die. So, clearly we are having non-vegetarian food to save Mother Earth…it’s for a noble cause :D.
Humans are supposed to be omnivores…didn't you study that in the Biology books in class 5…so, it’s natural for us to each flesh. If, it wouldn't be natural and ethical, they wouldn't have mentioned it the NCERT books. Blame them, not us. Plants have life too. Just because they can’t cry out in pain doesn't mean they can’t feel it. So, if eating them is justified, then eating animals is justified too. P.S-No offence meant to anyone, my favourite people are vegetarians :) . Seriously, write a novel......and it will be one of the best sellers..
Thankyou so much. It's one of the best compliments I've ever recieved :). P.S-Comment through your own profile, it's always a better feeling to reply to a real profile than a grey picture with Anonymous as the username :). :) :) Thankyou, I'm glad it made you enjoyed the humour ! Will certainly keep writing!